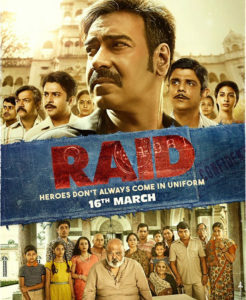 In Raid, Ajay Devgn joined up with Ileana D’Cruz and Shaurabh Shukla in a very serious story based on true events about corruption in Lucknow of 1981. For the soundtrack, powerful music is the key here, as the heavy action is not one really made for a lot of classic Bollywood music. The complexity comes in because for this story the music must both excite the crowds and give way to the tender moments. The music directors had to compose a combination of essentially mellow but powerful songs so that Ajay can still hit the villain where it hurts but still find a way to melt the heart whenever Ileana is on screen. The creation of this soundtrack falls to two different styles of music directors Taniskh Bagchi and Amit Trivedi. For two songs for Raid, Taniskh, has turned to remaking Indian classical music and for an added challenge chosen songs from much beloved Pakistani musician Nusrat Fateh Ali Khan. The Qawwali and Sufi singer is a name many have heard, his work is sprinkled throughout Bollywood films as it has been used and reused many times over. For Taniskh to take on this task thus who better than Rahat to give these songs the gusto and give the same feeling as their original singer did in the early 1980s. Sanu Ek Pal Chain, which has been remade in Bollywood film Judaai as ‘Mujhe Ek Pal Chain’ (starring recently deceased Sridevi), returns to its Punjabi roots with Rahat sounding a tempered version of his great father. Taniskh restores the balance here by giving light but traditionally classical instrumentation with harmonium, tabla, acoustic guitar and piano. Keep an ear out for the tingling sounds of water as played on the santoor giving the song a bit of life. The song is consistent and repetitive and in doing this the composer allows Rahat the best chance to do his father’s legacy justice. For Nit Khair Manga a more up-beat rhythm is generated by clapping, tabla and an electric bass guitar for the chorus. This all comes together in a delightful manner. Listeners are again treated to Rahat trying to do his father proud. The Sufi feel of this song its perfect for Lucknow in 1981 without being too slow for the modern audience. However, as this is also a remake of a remake (‘Mera Yaar Dildar’ – Jaanwar), it’s hard for it to stand out for those with long memories. Amit Trivedi on the other hand is well known for songs from the heart with a folky feel but modern instruments. So, leaving behind two classics of Sufi, the soundtrack next gives Black. Sukhwinder Singh is back doing what he does best, delivering power purely with his own voice. Amit keeps a softer marching beat in this light rock anthem in contrast to Singh’s performance. There is a lot of synth sound effects to give us police siren sounds, and synth drums remain consistent throughout to give a sense of foreboding. Throw in a strong chorus to give a sense of Ajay Devgn being backed by a crowd with some emphasis points made with traditional dhol for that Indian feel and this song gives the film a great launching pad. The final song is Jhuk Na Paunga. Amit brings his Coke India Studio experience along with one of its most popular singers, Papon, to give this song an easy jazzy feel. The electric guitar is employed to keep the beat here allowing the drums and dhol to play their own powerful part. Papon himself is clear and easy to listen to but is asked to stay well within his range throughout so listeners will not get the full experience of his singing here. Instead Amit Trivedi has employed a strong chorus of singers to provide the highs and lows in the flow of the music to give it a quirky twist. Music can be judged upon 5 main things: Rhythm, Beat, Melody, Singer(s) and X-factor. The x-factor is a personal feeling dependent on mood, weather, personal feelings and so on. As the first 2 songs by Taniskh are remakes they can’t rate well as they don’t have anything special that separates them enough from the original. The on-screen performance while highlighting the songs, doesn’t aid them to endear the audience. Amit Trivedi’s work is more of what audiences have come to expect from him and the songs are easy but quirky and thus interesting. They allow the visuals to take over but have enough power in themselves for cinemagoers to add them to their playlists. Thus, overall the album comes in comfortably in the middle. Raid is in theaters now!